BAGJUMP Yearly Inspection - Extend the lifetime of your airbag! Did You know that BAGJUMP offers annual inspections? With a well-maintained airbag, you can be sure that it will continue to be a star attraction in your trampoline park. Contact us and let our service team advise you. We'll take care of inspecting, servicing and repairing (if necessary) your airbag. We will plan this together for you to ensure the most convenient timing with minimal or no downtime. Full inspection of the airbag (seams, welds, materials). Inspection of all components and connections. Small onsite repairs if needed. Reset of the airbags ideal pressure/softness. Staff retraining for up to 8 Staff members. Full inspection report on the airbags condition including recommendations for spare parts. GET IN TOUCH with us for detailed information. The flame retardant substances used in foam cubes are very toxic when ingested as dust particles and can pose a serious health threat, especially to children and those with allergies or breathing difficulties like asthma. With a BAGJUMP® Airbag you just turn on the energy efficient blowers in the morning. No need to fluff the pit, throw foam cubes back into the landing areas. No need to constantly replace expensive foam cubes or perform costly clean ups of the pit. Climbing out of a foam pit can be hard work and often takes quite some time. 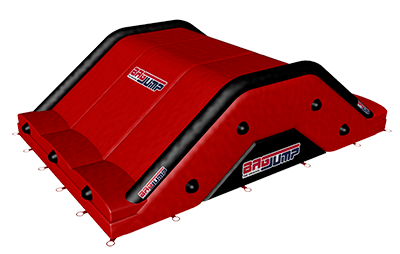 With an airbag the jump frequency can be increased massively (up to 10 jumps/minute), making the pit area one of the most popular features of your sport facility. We have built hundreds of airbags for all pit shapes and trampoline types and can deliver the custom solution you need for your current pit without expensive remodeling. Send us your plans and let us do the work! The Foam Pit Airbag is internationally certified for quality and safety, providing super soft landings and superior functionality to a standard foam pit (gradual impact absorption rather than sudden impact absorption as with foam). Due to highest fire safety certifications of our materials, you will save costs by not having to install expensive sprinkler systems as required for foam in certain states of the USA. When trying to clean your foam pit, you will find sweaty cubes, hairs, old socks and plenty of other unhygienic situations. It takes hours of throwing out cubes and shoveling dust to maintain. 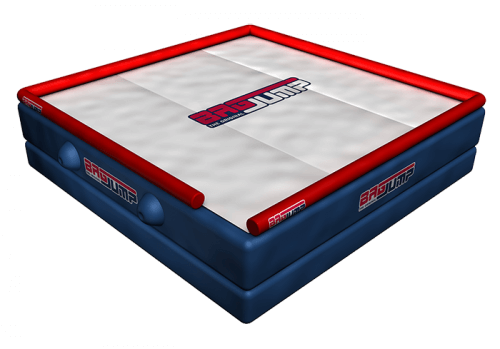 With a BAGJUMP® Foam Pit Airbag, this will be a matter of minutes. Want to go big? This airbag system will help you push your skills to the next level. Getting sick and tired of foam? Upgrade to the technology of the future and never worry about cleaning your foam pit again. The next level of action sports training. Crash or ride out when you land a trick - on a real landing. Have a crazy idea you want to run by us? Check out some of the projects we have done. with us for a professional consultation regarding your project.